When Pete Maguire mentioned in early 2007 that he was going to ride around Australia by bicycle the thought of tackling this continent by pedal power alone had never even crossed my mind. Pretty soon though I thought it was something worth attempting and put my hand up as a candidate to ride with Pete, partly for support and partly because I thought it would be the best possible way to see Australia. I had been around Australia in 1964 as part of a family trip that lasted 9 months. Five kids and Mum and Dad in an EH Holden station wagon and several hundred pounds of camping gear. We took three weeks to drive from Canberra to Halls Creek in the Kimberley, sitting on 50mph (80km/hr), three in the front, three in the back and one in the very back. After leaving Roma in the Queensland outback the roads first became single lane tar, where you drive onto the shoulder when you encounter oncoming traffic, and from the NT border it was nothing but corrugated dusty roads for the forseeable future. For three or so months we lived in a geological camp at Louisa Downs Station 100km west of Halls Creek, my brother and I attended school in Halls Creek during the week and returned to the bush life on weekends. After the end of the field season we moved on down to Perth, once again camping all the way down the WA coast. It was still dirt roads most of the way down to Perth and unlike today's roadhouses every 200km or so, we had to be self sufficient for most of the long journey. In Perth we spent a further three months in a house a stone's throw from Scarborough Beach. Eventually it was time to return to Canberra, and the crossing of the Nullabor, which in those days was still dirt and full of potholes and bulldust. We pulled into our driveway in Canberra on Christmas Day 1964 after what was a relatively remarkable trip. Today, the trip by car presents very few challenges for a family sedan, the roads are tarred all the way around, there are many more facilities on the roads even in the isolated stretches, and there's a constant stream of 4WD vehicles circumnavigating this great continent. How different it is going to be by bicycle, averaging in a day what a car puts behind it less than an hour. I came up with my name for the ride when I saw the flag that came with my trailer (see Equipment), which goes under the name of a BOB Trailer. (BOB stands for Beast of Burden). We have a trailer each, so there are two BOB trailers. 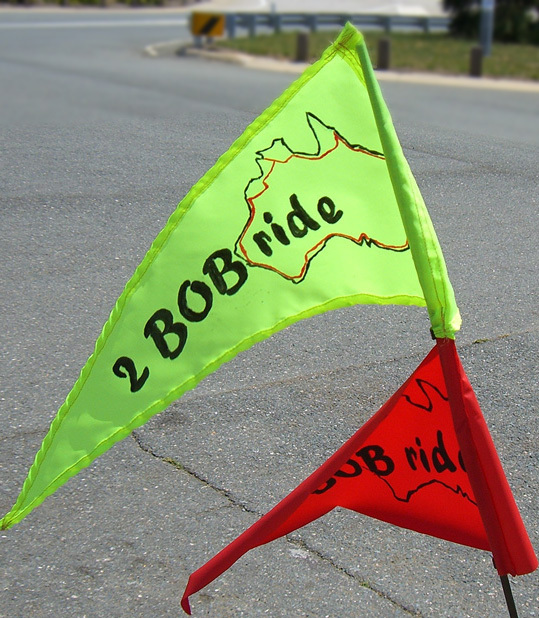 We are two Blokes on Bikes, so there's another variation on the two BOB theme. And finally, I hope to come out of the ride with at least a couple of bob's worth of experiences. So all in all, a two BOB ride in more ways than one. Pete has a different name for the ride, as he is fundraising for Cerebal Palsy Australia. For details on this important aspect of the ride, you can see Pete's website and blog here.